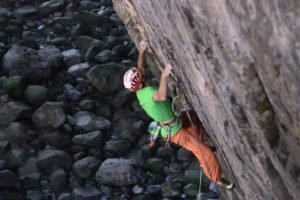 In this short creative film from Titan Media, Ontario ice and rock climbing Shaun Parent says a few words about his time in the hills. Parent, owner of Superior Exploration, Adventure & Climbing Co. Ltd., has found and climbed hundreds of new ice routes in eastern Canada over the past 40 years. He has been ice climbing since 1979 and instructing since 1983. When Parent started climbing in Orient Bay (a 30 kilometre-long canyon that guides water from Lake Nipigon into Lake Superior) in the early 1980s, no one in the area had even heard of ice climbing and it took awhile for the community to embrace it. He remembers hiding when people called the police thinking they were trespassing or climbing the cliffs to commit suicide. But ice climbing was already becoming popular in Colorado and Canmore and Parent was determined to bring that tourism potential to Nipigon. Today, hundreds of climbers from around the world make the trip to northern Ontario every year for ice climbing and Orient Bay is often cited as the third best spot for ice climbing in Canada and included in the top six of North America. He remembers one day when a couple on a snowmobile passed him while he was leaving a climb. They slowed, and one of them asked if he was Shaun.